Beautiful You: Room Re-Vamp | Black, White & Copper! Room Re-Vamp | Black, White & Copper! Sorry, I took a mini hiatus in January, however things are looking up now so I thought I would share my latest project with you all. Now for a long time now I have loved interior design and home decor, so I set myself a challenge to re-vamp my room in Cheltenham. 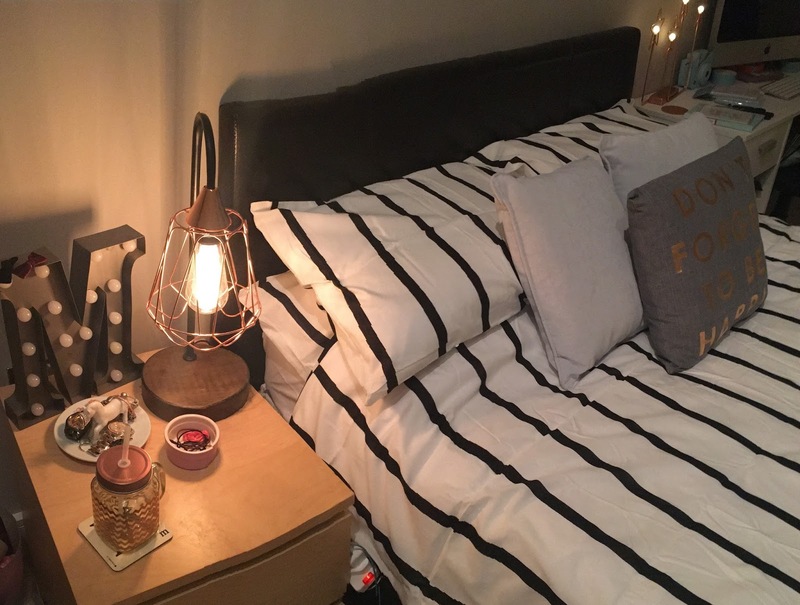 I didn't like it too much before, I never kept it tidy and I didn't really want to spend time there however my opinion is very different now and I thought I'd share with you what I did! The first part of my room I knew I definitely wanted to change was the window sill, I never opened my blinds because it was horrible but now it is holds loads of cute things whilst adding brightness to my room. Going from left to right, the first thing I bought for this area was two glass boxes with copper edging, £15 from IKEA. I had wanted some of these for ages and they weren't a bad price so I picked them up although I don't have a use for the second one yet, I just have some copper lights in this one and they were from New Look for £9.99. Next are three dishes, two black and one white, they are all from IKEA and I believe they are £1.50 each which is so cheap. I then bought some tea light holders from New Look and they were £8.99 for the two which are inside the black dished and in the white one is a vanilla candle from IKEA too. 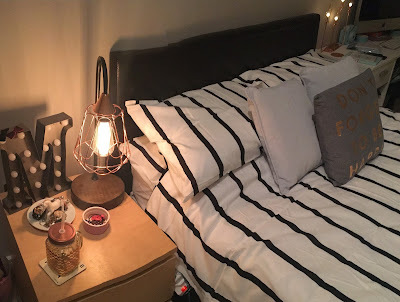 On the right I have my copper M, I bought this in Oliver Bonas a while ago and it has been in my room but it looks much better here, this was £10 but I'm not sure you can get copper anymore. 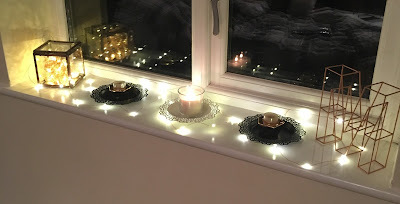 Lastly, I have just run some copper wire lights around the decorations and these were also from New Look for £9.99! 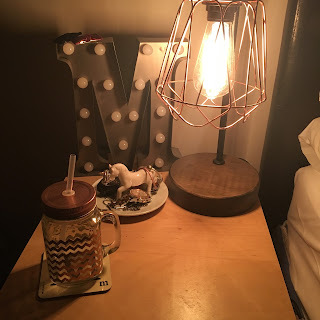 This is probably my favourite new thing in my room and that is my copper side light, I got this from Home Sense in Swindon and when I saw it in there I could not leave it behind although it did cost me £25!! The bulb in my light is a vintage one where you can see the filaments, although it doesn't look like it in the picture, I got this from a little shop in Cheltenham for £3.99! Next to my lamp I have my light up M, I think this came from a little boutique in The Lanes in Brighton and I paid £20 for it but these are everywhere at the moment so you could easily find a similar one! Then I just have my copper cup which my sister bought me for Christmas, my unicorn jewellery holder which I won in a Twitter competition and my M coaster which I bought whilst I was still at uni! Th next area of my room that I re-vamped wa my desk, now this has been covered in rubbish for so long that I never really used it so I have tidied it up and added a few things to make it fit in with the rest of the room. Obviously my iMac has always been there and that takes up a lot of space so I didn't have much to work with but I think it looks so cute now. First thing I did was moved my pen holder down to one of the shelves as it didn't look nice and I replaced it with my polaroid camera and my new star light. 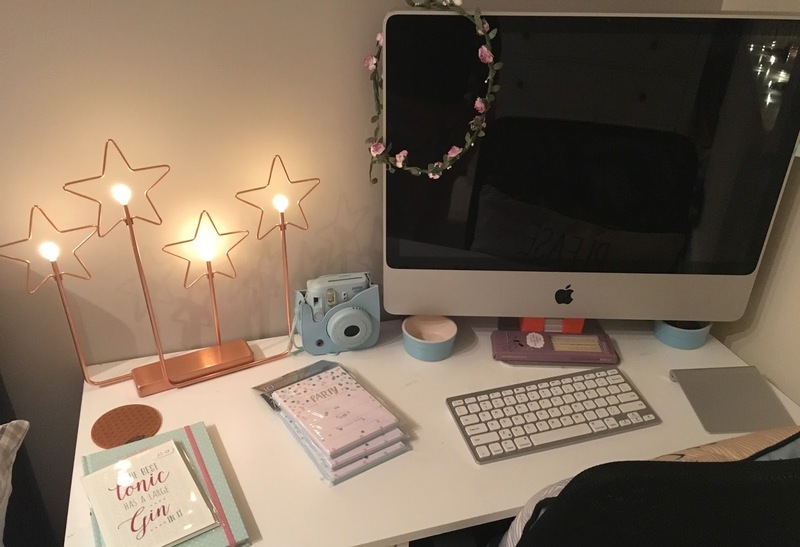 The star light is from IKEA and at the moment it is reduced from £24 to £10 which I think it an absolute bargain, to the point where I just wanted to buy two for the sake of it! Lastly, I just decided to get some new bedding to match the new black and white theme. I wanted to keep this plain and simple so I went with a striped one from IKEA and it was £25 for the cover and 4 pillowcases. I hoped you enjoyed this sort of room tour post, I was thinking about filming a updated room tour video on my YouTube channel so if you would like to see that let me know in the comments and I will se what I can do. 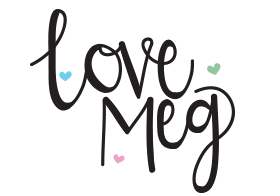 Also leave me suggestions for blog posts in the comments as I have really been stuck for inspiration at the moment. Hopefully I will see you all soon!